Described as a comical hybrid of Fawlty Towers and Michael Frayn’s seminal meta-theatrical comedy Noises Off, this production has proved an astoundingly popular show, with hysterical performances and superb timing. When the Cornley Polytechnic Drama Society attempt to stage a 1920s murder mystery play, nothing goes right; prop doors don’t open, sets come crashing down and tempers flare in this brilliantly-observed farce. 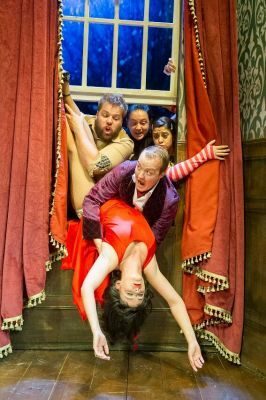 The winner of this year’s Olivier Award for Best New Comedy, The Play That Goes Wrong has been lauded by critics and audiences alike. Nearby hotels include the 4 star Strand Palace Hotel and the 4 star Kingsway Hall Hotel. Both are within walking distance of the theatre. My boys loved The Play That Goes Wrong .. really funny and most enjoyable. 'The Play That Goes Wrong' is so hilarious that we are booking to go again and taking relatives this time ..... totally off-the-wall. It is so inventive. The slapstick humour was so universal that foreign visitors were enjoying as much. You have to see it for yourself.